He is Born in Mertinj, Permet in January 6, 1961, he has finished his post-university studies for Language & Literature in some villages in the northern Albania, Puke. After the graduation he has worked as a teacher of Literature and by the time being he is a teacher in the high school “Sami Frasheri Permet”. 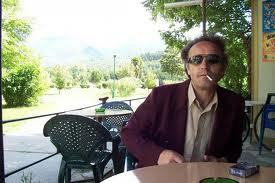 He is the president of the writers’ Association, branch of Permet as well member of the Poetic Galaxy “ATUNIS”. He is the director of the publishing house “Fjalët e Qiririt”. His poetries are published in several magazines like: “Zeri i Rinise”, “Zëri i Rinisë”, “Drita”, “Nëntori”, etc. He has published many volumes with poetries like: “Mars”, “The Owl confused”, “Return from the Dead” with which he has won the first price in the competition “PEGASI”, “Pouring of Thunders”, Resignation of The Tiger”, “Perspiration of The Poet”. Soon will appear is novel: “Time without license plate”. On March 2007 appeared the Volume with Essays and comments “From one author to the other”, assisting the teachers and the students of the high schools. Parts from his creative work have been published in foreign languages like Italian and Greek. He has participated in the international competition on poetry held in the city of Motola, Italy and the competition on fable held in Athens Greece, where he has been honored with the third price for fable. I ran but I never found its grave. Time remains in the eyes of the blind. Push each other in the line for wigs. Cold rains melt away upon them. In the morning I had become Laocoön. A house or a grave? While in my pockets I had nothing but my soul. The beautiful girls broke the ewers. How many young seedlings do not grow to become old. I await your failure to come. They separate passes and gorges. How does it not cease beating in solitude? The rainbow opens its door in the rain. Melt away like dew in May.